Only Sir Donald Bradman boasts a higher First Class batting average than the 71.64 that Vijay Merchant achieved in a career that began in 1929 and ended in 1952. Sachin Tendulkar has also been playing the First Class game for 23 years, so perhaps now is the time to try and make some sort of a comparison between these two great Indian batsmen. Merchant was born into a wealthy Bombay family in 1911, the family fortune having been derived from the textile business. This is of some significance as it meant that while Merchant did not derive a living from the game, he had no need to devote any part of his time to the task of supporting himself and his family financially, and could concentrate on the pursuit of cricketing excellence, and to that extent he was in the same fortunate position as Tendulkar. The other benefit of his family wealth to Merchant was that he did not have to pander to those Princes and business magnates, who often had little actual knowledge of cricket, but who ran the game in India in those days. He was described by fellow player Professor DB Deodhar as a man who..lived and behaved like a commoner, honest and upright, never asking for special treatment. 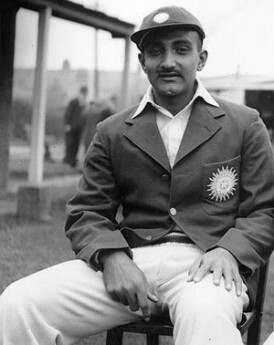 Unlike Tendulkar however, Merchant’s development as a batsman was hampered by political issues, which meant that he was not a member of the Indian touring party that came to England in 1932 when he was 20. Along with other leading Hindu players Merchant was instructed not to participate in the trials held for the purpose of selecting a team. While others did still manage to secure their passages to England Merchant, who had played only three First Class matches in three seasons, simply didn’t have the experience upon which the decision to take him could be made. By the time Douglas Jardine’s MCC side arrived in 1933/34, the first ever tour of India to include a Test series, Merchant was sufficiently well known to be selected for each of the three Tests. He made a start in each of his six innings, never failing to reach double figures and averaging fractionally under 30, but he had only one half century to show for his efforts. Jardine had, however, seen enough of Merchant to describe him as the soundest batsman in India. Some care does need to be taken at this point as the England side who played in the Test was some way short of full strength. Their captain apart, only Hedley Verity of the party who had caused such controversy in the previous winter in Australia was present. So there was no Harold Larwood or Bill Voce to intimidate the Indians, nor Gubby Allen or Bill Bowes. That much conceded the opening bowlers at Jardine’s disposal were still quality players, Stan Nichols and Nobby Clark. The latter in particular, left arm fast and hostile, could be a nasty proposition and caused some controversy during the tour. But the quick stuff certainly held no fears for Merchant. In one match he tried to hook a Nichols bouncer and, missing the ball, was struck on the chin and sustained a wound that required stitches. At the earliest opportunity after receiving treatment he was back out in the middle, playing Nichols with a straight bat, and remaining undefeated. In addition to Verity there were some excellent spinners in the England side, and Charles “Father” Marriott, Les Townsend and Jim Langridge all performed well over the tour as a whole. Outside the Tests Merchant did not, as some of India’s leading players did, follow the tourists around the sub-continent, but he did face them twice more in Mumbai (then Bombay) and in four more innings was not dismissed and recorded two additional half centuries, so overall against Jardine’s men he averaged more than 60. It is worth pausing at this point to try and describe the sort of batsman that Merchant was. This is not entirely straightforward as Indian cricket between the wars is not very well chronicled, and to date no fully researched biographical work about Merchant has ever appeared. What we do know is that he was a short man, standing only around 5 ft 7 inches, and reference is often made to his ability to hook and cut, but descriptions of his innings rarely suggest particular style, grace or power. What is clear from contemporary records is that Merchant would often bat for a long time, and was encouraged to do so by the rule that prevailed in Indian First Class cricket throughout his career that a match would be won by the side ahead on first innings. That he could bat swiftly when called upon to do so is not in doubt, his scoring a double century at a run a minute against Sussex in 1946 being testament to that, so perhaps Deodhar had a point when he wrote of Merchant There were no one day matches and limited overs cricket in those days and he got no chance to adopt the attacking style of batsmanship of which he was capable. But generally his peers described a copybook technique and a sound defence. CK Nayudu, a dashing crowdpleaser with the bat if ever there was one, was quoted as saying Merchant is the man if you want to save the match, but I will never bank on him if a match has to be won and risks have to be taken. All the great batsmen have a signature stroke and with Merchant it was the late cut. Madhav Mantri, uncle of another great Indian opening batsman, Sunil Gavaskar, wrote that …he excelled in the late cut. Although it is regarded as a delicate stroke, in the case of Vijay it was a sledgehammer. Nephew Gavaskar himself tells a story of when he was a 15 year old schoolboy. Merchant, then 53, attended a coaching session that was being filmed. Test players Farokh Engineer, Ajit Wadekar and the Nawab of Pataudi Jnr were all involved and Merchant was there specifially to play the late cut. Gavaskar describes Merchant taking guard against Kailash Gattani, a young bowler who enjoyed some success at First Class level as a medium pacer, but who at that time Gavaskar says was considered as quick as anyone in India. The old master, at the first attempt, sent the young tyro’s delivery speeding to the third man boundary. Gavaskar added Pataudi, Wadekar and Engineer exchanged amazed glances while we schoolboys were left with our jaws gaping. It was as perfect a late cut as one could see. Merchant made the first of his two tours to England in 1936, when he played in all three Test matches, averaging 47 and recording one century and one half century. On the tour as a whole Merchant scored over 1700 runs at an average of more than 51, and his achievement was recognised by his selection as one of Wisden’s five Cricketers of the Year. In those days statisticians kept tourist’s figures separate from those of domestic players, but combining the two shows that only Walter Hammond and Surrey’s Laurie Fishlock stood above Merchant which, for a man who had never played in England before, was a notable achievement. England were due to tour Australia the following winter, so there was no tinkering with the team in a less competitive series, and no question but that on this occasion the Indians were up against full strength opposition. Merchant’s success on the tour is all the more impressive given that not only did he not enjoy the support of his captain, but even had to contend with his trying to sabotage his batting. The captain concerned was the Maharajah of Vizianagram. Tradition dictated that an Indian touring side had to be led by a prince, irrespective of his cricketing ability. In 1932 the Maharajah of Porbandar had been such a poor player that he only scored two First Class runs on the entire tour, but then he recognised his limitations and played only four times, and allowed CK Nayudu to captain India in the only Test. In 1936 Vizianagram insisted on playing in all the Tests. In fairness to him he was a significantly better player than his predecessor, but certainly not up to Test standard. Merchant told his captain in no uncertain terms that he should not play in the Tests and should allow Nayudu to captain the side once again, but to no avail. Such was Vizianagram’s ire that in the second Test he instructed Mushtaq Ali, Merchant’s opening partner, to run him out before Merchant reached his century. Fortunately the instruction was disregarded. Following his success in England in 1936 neither Merchant nor India were to play Test cricket again for a decade, and Merchant therefore missed the opportunity, during what should have been the best years of his career, to cement his reputation. He scored heavily in domestic Indian cricket throughout that period but he lacked the ultimate challenge and the ability to test his game against the world’s best. In as many as seven home seasons over this period he averaged over 100, in two of those it was more than 200 and once, in 1938/39, his average was 334. It is true that there were not many games played in any of those seasons, and the individual years are all susceptible to being described as freakish, but it is not possible to be so dismissive in relation to the overall picture. During this period the one big disappointment of Merchant’s career happened, that being the visit of a touring party led by former England captain Lionel Tennyson in 1937/38. Of the party of 15 all but two had or were to play Test cricket for England, and Wisden considered that Tennyson’s claim that his men were probably the strongest side to visit India was justified. There were five “Unofficial” Tests, and the series went to the visitors 3-2. If there had been any sort of form from their captain India would certainly have reversed that, but Merchant had a wretched time, scoring just 98 in nine innings despite dropping himself down the order in the later games. As in 1933/34 he did better when he encountered the tourists outside the representative matches, so perhaps his failure was down to the burden of captaincy. If it was then it was a problem that he had at least partially resolved by 1945/46, when he captained an Indian XI in three matches against the Australian Services XI that was on its way home from England after its success in the 1945 “Victory Tests”. India won the third of three representaive games after two draws, and Merchant averaged more than 60. In 1946 official Test cricket began again and its first act in the post-war era came in England as the now amateur Walter Hammond captained the hosts against an Indian side led by a former England man, the Nawab of Pataudi Snr. Merchant was 35 but he enjoyed a magnificent tour, scoring almost 2400 runs and averaging more than 74. He scored a half century in the second of three Tests, and a superb 128 in the final match at The Oval, an innings brought to an end in unusual fashion when he was run out, beaten by a deflection from Denis Compton’s right boot. On this occasion only Hammond enjoyed a better summer than Merchant, and his overall figures left the likes of Len Hutton, Denis Compton, Bill Edrich and Cyril Washbrook far behind. It is true that England were not, her cricketing resources having been ravaged by six years of war, particularly strong that summer, but there was one bowler destined to become one of the greats, Alec Bedser, who began his Test career with 24 wickets at 12 runs each so, particularly as opener, Merchant faced a severe test. Only once in the four matches in which they lined up against each other did Bedser dismiss him. India’s first tour of Australia took place in 1947/48 and the following season saw the first West Indian side visit the sub-continent and five Test matches were played on each tour. Sadly Merchant played no cricket at all in either season due to illness and a persistent groin injury. More than a decade previously, an unofficial but strong Australian side had visited Australia in 1935/36, and injury had deprived Merchant of the opportunity to play that side as well. In the event apart from England his only exposure to sides from outside the sub-continent were those matches against the Australian Services side in November and December of 1945 in the course of which Merchant scored one century and two half centuries and in each of his seven innings got into double figures. What would a 36 year old Merchant have achieved against the vibrant young Australian side that went on to become “Bradman’s Invincibles” a few months later? Given that the 39 year old Australian captain averaged 178 for the series, and that three Indian batsmen all did well, despite being caught on a treacherous sticky wicket in the first Test, I suspect he would have been successful. Similarly against West Indies in what proved to be a batsman’s series I believe he would have scored heavily on home soil. Everton Weekes averaged 111 for the series and five of his teammates at least 40, as did five Indians. By 1949/50 Merchant was at long last fit enough to resume his cricket career and he was appointed India’s captain for the matches against the first Commonwealth side. There were three such sides that visited the sub-continent in the early 1950s. They comprised mainly professionals from the Lancashire Leagues, and thus contained some very fine players indeed. This first side was led by Frank Worrell and contained several international players and a clutch of Australians, including Cec Pepper, Bill Alley and George Tribe, all of whom might well have enjoyed long Test careers had they not thrown in their lots with the Leagues. In the first unofficial Test Merchant injured his hand in attempting to take a catch from Frank Worrell and did not bat, and although he was fit enough to be able to score 78 and 94 in the second match the effects of his injury were such that he did not play again that season. In 1950/51 another strong commonwealth side arrived in India and this proved to be Merchant’s last full season. Worrell led the visitors again and this time his resources were if anything stronger than a year previously. Merchant captained India and while he was not quite as successful as he had been in the past he still managed to average 45 for the series. He showed his mettle particularly in the second match when he top scored with 37 in the Indian first innings of 82. Foolishly as it turned out Merchant had elected to bat on winning the toss, but the Commonwealth bowlers made full use of something generally unfamiliar to the Indians, a green wicket, to cut a swathe through the home batsmen. Six Indians were dismissed without scoring before, at 38-8, Merchant finally found some support from CS Nayudu, the younger brother of CK, as 42 were added for the ninth wicket. The following season, 1951/52, added one final match to Merchant’s career tally. He had intended to play for the whole season, but after scoring a commanding 154 in the first innings of the first Test against England he injured his shoulder while fielding. He did not immediately announce his retirement but it was clear by the start of the following season that his body was no longer able to withstand the rigours of First Class cricket and he slipped into retirement. It is unfortunate that Merchant was not able to travel to England for a third time in 1952. He would have been 40 years of age, but while the flesh was weak his record does not suggest that his batting skills ever deserted him, and had it been possible to nurse him through that tour then the disaster that befell the Indians in the face of a sustained battery from a youthful Freddie Trueman, while it could not have been avoided altogether, would surely have been ameliorated by Merchant’s presence at the top of the order. The 1951/52 side led by Nigel Howard had not been a full strength England, but the bowling was led by a young Brian Statham and Kent’s Fred Ridgway, distinctly sharp and a man who had enjoyed considerable success with the second Commonwealth side, and who did pretty well on Howard’s tour as well. So Vijay Merchant finished his career, which consisted of 150 First Class matches, with a career total of 13,470 runs at that commanding average of 71.64. He scored 45 centuries and had a highest score of 359 not out, which took him 20 minutes short of 11 hours in a Ranji Trophy match between Bombay and Maharashtra. In the early part of his career Merchant was also a useful bowler who bowled brisk off spin and he took a total of 65 wickets. One record Merchant holds, which is unlikely to ever be beaten, is that his last 3 wickets in First Class cricket were a hat-trick. After leaving the game Merchant became an administrator and broadcaster and between 1968 and 1971 he was one of the Indian selectors who were responsible for the sides that won series in both West Indies and England for the first time. He died, aged 76, in 1987. A younger brother, Uday, also played First Class cricket and he too was a more than useful batsman who ended up with an average of more than 55. Perhaps surprisingly in view of the frequency with which cricketing talent seems to pass through succeeding generations of Indian families no other member of Merchant’s family has ever played First Class cricket. The title of this article invites the sort of judgment that forum threads on Cricketweb constantly propose, and in many ways the comparison is, in reality, just as odious as most others. Merchant had significant advantages over Tendulkar, primarily arising out of the playing conditions that prevailed in India in his era. The strength of the bowling attacks that Merchant faced can also be questioned, as can the limits of his experience in terms of his only ever playing in England and India. So if I had to make a choice between the two for my imaginary dream team it would have to be Tendulkar, but that doesn’t alter the fact that the superb performance of the veteran Merchant in England in 1946 must support the contention that he was a top class batsman, and that while he may not be the second best ever to have graced the game, he certainly fully merits his place in the higher echelons of batsmanship. 18th comment and first to actually reference the feature – top job Martin on an under-appreciated batsman.